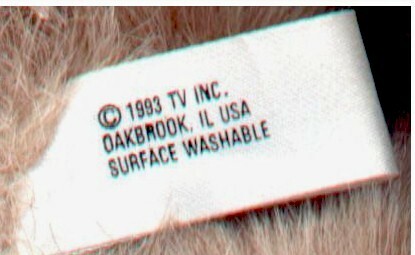 Front of tush tag reads "� 1993 TV INC OAKBROOK, IL USA SURFACE WASHABLE." Tush tag shown is from a fourth generation Purrcy. Back of tush tag reads "ALL NEW MATERIAL POLYESTER FIBER PA REG.# 1965 HANDMADE IN CHINA." with large C E.
Front of tush tag reads "� 1993 TY INC OAKBROOK, IL USA SURFACE WASHABLE." Tush tag shown is from a second generation Fraser. Front of tush tag reads "� 1993 TV INC OAKBROOK, IL USA SURFACE WASHABLE." Tush tag shown is from a fourth generation Cassie. 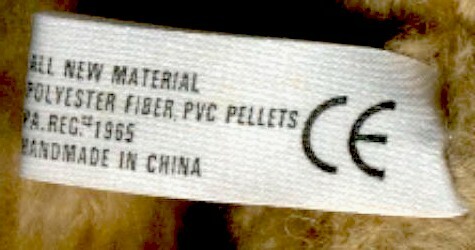 Back of tush tag reads "ALL NEW MATERIAL POLYESTER FIBER PVC Pellets PA REG.# 1965 HANDMADE IN CHINA." with large C E.
Front of tush tag reads "� 1993 TY INC OAKBROOK, IL USA SURFACE WASHABLE." Tush tag shown is from a fourth generation Tiny Tim. 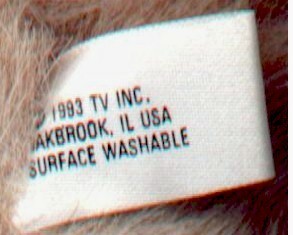 Front of tush tag reads "� 1993 TV INC OAKBROOK, IL USA SURFACE WASHABLE." Tush tag shown is from a fourth generation Jeremy. 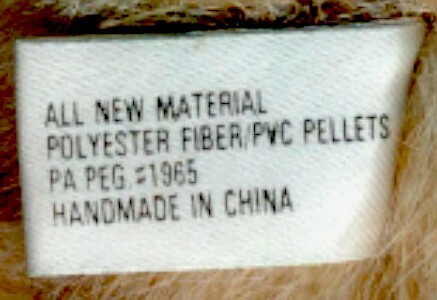 Back of tush tag reads "ALL NEW MATERIAL POLYESTER FIBER/PVC PELLETS PA REG.# 1965 HANDMADE IN CHINA." 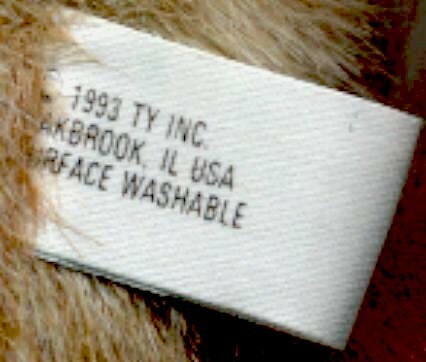 Front of tush tag reads "� 1993 TY INC OAKBROOK, IL USA SURFACE WASHABLE." Tush tag shown is from a fourth generation Dickens. 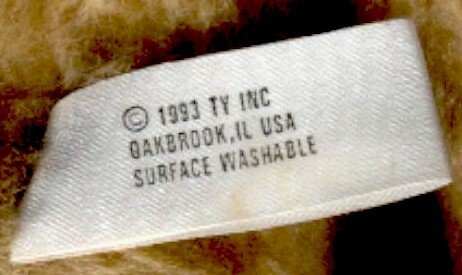 Front of tush tag reads "� 1993 TV INC OAKBROOK, IL USA SURFACE WASHABLE." Tush tag shown is from a fourth generation Grover Gold. 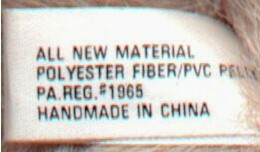 Back of tush tag reads "ALL NEW MATERIAL POLYESTER FIBER PA REG.# 1965 HANDMADE IN CHINA." Front of tush tag reads "� 1993 TY INC OAKBROOK,IL USA SURFACE WASHABLE." Tush tag shown is from a fourth generation Dexter. Front of tush tag reads "� 1993 TY INC OAKBROOK,IL USA SURFACE WASHABLE." Tush tag shown is from a fourth generation Purrcy. Note the difference in the size of the font in "Surface Washable" than the one above.